Just as Warnings / Promises finally sees its belated release on American shores, our man Neil sat down to talk with Idlewild's Roddy Woomble, about maturity, acoustic shows, Edwin Morgan and President Bush. Scene Point Blank: Hi Roddy. Thanks for taking the time to talk to Scene Point Blank, how are you? Roddy: Thanks very much. I've never been here before. Scene Point Blank: Nah, nor have I. What the made you decide to come to Lisburn? Roddy: We just got asked to do it. Scene Point Blank: Idlewild always seem to play a lot of weird places. You've already played in Forres, which is way out in the north of Scotland and Holmfirth (the village where they film "The Last of the Summer Wine") this year. Is there anything special about playing in these sort of places? Scene Point Blank: Talking about Holmfirth, it was another acoustic gig. Idlewild seem to have been playing a lot of them at the minute. Roddy: Yeah, we did an acoustic tour at the start of the year, which was really cool. I mean, it's just a different way, for us, to play our songs. Scene Point Blank: Why did you decide to take the acoustic shows onto the road now, when you've said you've been playing together like that for years? Roddy: We just got better at playing, and we found that, interestingly, that we could put the same song across completely differently. Roddy: Exactly. There's not a great theory behind it. It's just something we found we could do. Scene Point Blank: You've made a few B-Sides of the acoustics songs on the last couple of singles (Love Steals Us From Loneliness, El Capitan, The Bronze Medal), have you got any plans to do a proper acoustic record? Roddy: I don't really know. We're winding up playing in the UK and Ireland and Europe in the next few weeks and then we're going off to America for September and some of October and then, I think, after we finish, then we'll start thinking about another record. I don't think we're gonna do so much touring after that. I think we'll start working after that. It really just depends on what kind of record we want to make. I mean, I feel now that the band belongs to us, in a way. Maybe seems like a weird thing to say, but I feel now we're older and we know exactly what we want to get from it, but we can kinda do what we want and we realise that people will either stay with that and enjoy the music or just move onto something else and that doesn't bother me anymore. It used to when I was twenty-five because I wanted to please everyone, but now, I've figured that if you do do something good then someone else is bound to like it. Roddy: Yeah, but there's nothing I can do about that. I think it's the best thing we've done, and that's my opinion of it. I think we play our songs well. I think they're really good, strong songs, but if someone doesn't like it, I'm not going to try and convince them. Scene Point Blank: You've mentioned recently on the website that you've been working again with [Glasgow poet laureate] Edwin Morgan. Care to give anything away about that? Roddy: He's been writing words and we've been putting them into songs. We're going to do something with them. Probably, again when we get back from America, then we'll start working more on that idea. But there's nothing more at the moment than we've just been working with him. Scene Point Blank: Are there any particular influences you're taking into the project? 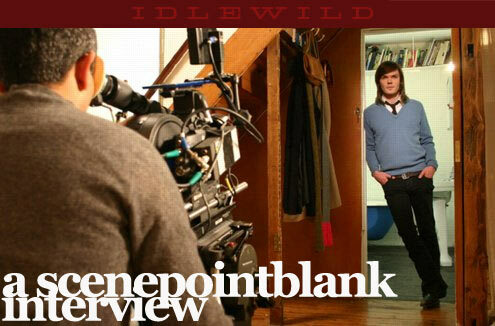 Scene Point Blank: Mentioning that, words always seem to have been an important part of Idlewild's music. For me personally, one of your lyrics from â€œCentury After Centuryâ€ â€“ â€˜didn't hear cheerleading for creative writers' always stood out, because, growing up in school, it's always about playing sports and even music. No one ever gets credit for writing anything. Roddy: Yeah. I mean, that's the point of it, to an extent, is the fact that it's one of these unseen kinda powers, isn't it? Almost like people that sit at the back of class and write a story that eventually resonates with people. People that kick a football around, you know, they can only go so far. Scene Point Blank: If we can move on to talk about the evolution of the band. Captain and Hope is Important seems like kids, basically content to thrash around Now, even the parts where you are thrashing around seem a lot more considered. Roddy: It's just because I didn't want us to be that band anymore. I've done that. Scene Point Blank: Been there, done that, yeah? Roddy: Well exactly. I mean, if you eat the same meal every night, you'd just be like, "I want to try something different." Scene Point Blank: Have you always tried to move on, or is it just something that's happened naturally? Roddy: A bit of both, actually. We've always, consciously, never wanted to make the same record, but we also never really know what we want to make, so we sort of stumble upon that, and it becomes this different thing. Scene Point Blank: With the changes in the band in 2002, especially with Gavin coming for the writing of the new album, did that sort of change the way you had to go about it? Roddy: Yeah, well, it's just different people in different environments. Everything was different really with this record, very subtly, and in so many ways, that adds up to something quite substantial. So yeah, it's just kind of like a new band really. Scene Point Blank: When you were recording Warnings / Promises in America, did you find getting towards the run into the presidential election had any effect on the album? Roddy: We weren't really in America for a lot of that, actually. It's kinda fucked up, though, isn't it? It's just real disappointment when he got re-elected, I think. Scene Point Blank: Nor me. It shouldn't really even have been a contest. Scene Point Blank: It just came down to the Democrats to choose a decent candidate and, instead, they managed to choose the worst candidate in my living memory. Scene Point Blank: Well, that's really about it, Roddy. Thanks again for talking to Scene Point Blank. Words by Neil F. on Oct. 16, 2010, 11:23 a.m.
Posted by Neil F. on Oct. 16, 2010, 11:23 a.m.
Posted Nov. 3, 2015, 6:45 p.m.
Posted Sept. 23, 2015, 10:03 a.m.
Posted April 9, 2014, 5:19 p.m.